7 magical and outdoorsy things to do this Spring in Nevada City! Spring. A time of growth and renewal. A time to get outdoors and enjoy the sunshine. It’s also a time of new beginnings, and healing… and a little bit of magic! 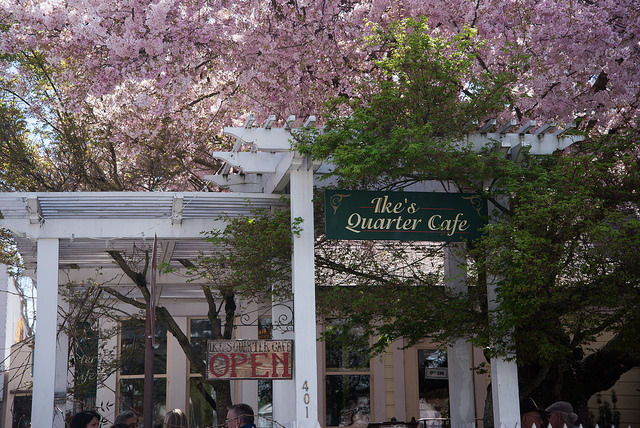 Here are 7 things you can do this Spring in Nevada City. From faeries and crystals to tulip gardens and cherry blossoms… Nevada City has it all. 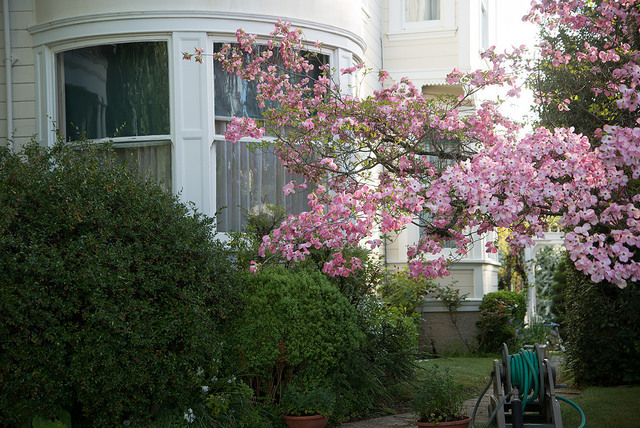 Eat under the cherry tree at Ike’s, now to early April! Spring is the perfect time for breakfast or lunch at Ike’s. Sitting outside under the huge, gorgeous cherry tree is truly magical. Ike’s has many options for everyone, including vegan and gluten free items. 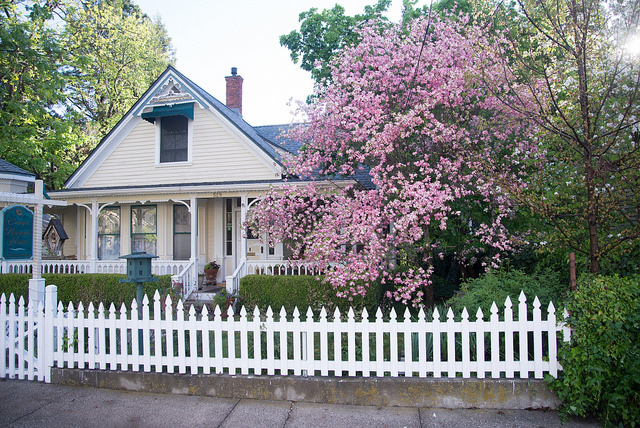 With many Victorian homes sporting pink and white dogwoods, it’s hard to find a single dull area in Nevada City. The trees are definitely hard to miss! 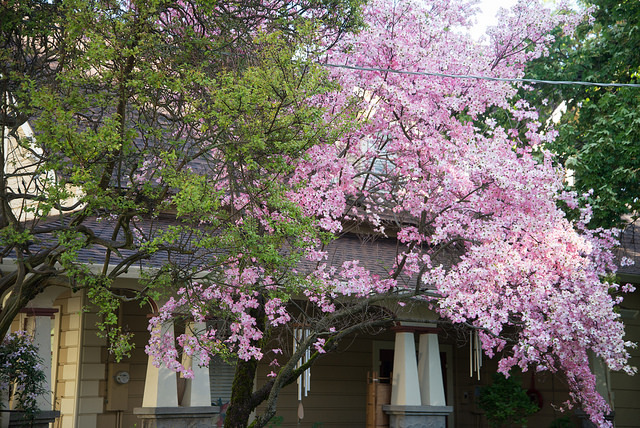 Wander through the downtown neighborhoods to see the dogwoods blooming in mid-March through April. Each Spring, from mid March to the first weekend in May, docents lead wildflower walks on Saturday and Sunday. Meet at the trailhead at 11 a.m. Wear comfortable shoes and bring water for this easy hour and a half walk. This trail starts across the river from the Visitors Center just on the opposite side of the modern Pleasant Valley Road bridge and winds up the river. The trail follows the route of the old 1877 Caleb Cooley water ditch, so is mildly sloped and has been made wide enough for wheelchair accessibility. An upper trail from the parking lot with no severe climbs has been added recently by constructing two new bridges across river tributaries. Buttermilk Bend trail offers spectacular views of the river and is a showcase of color during Spring wildflower season. 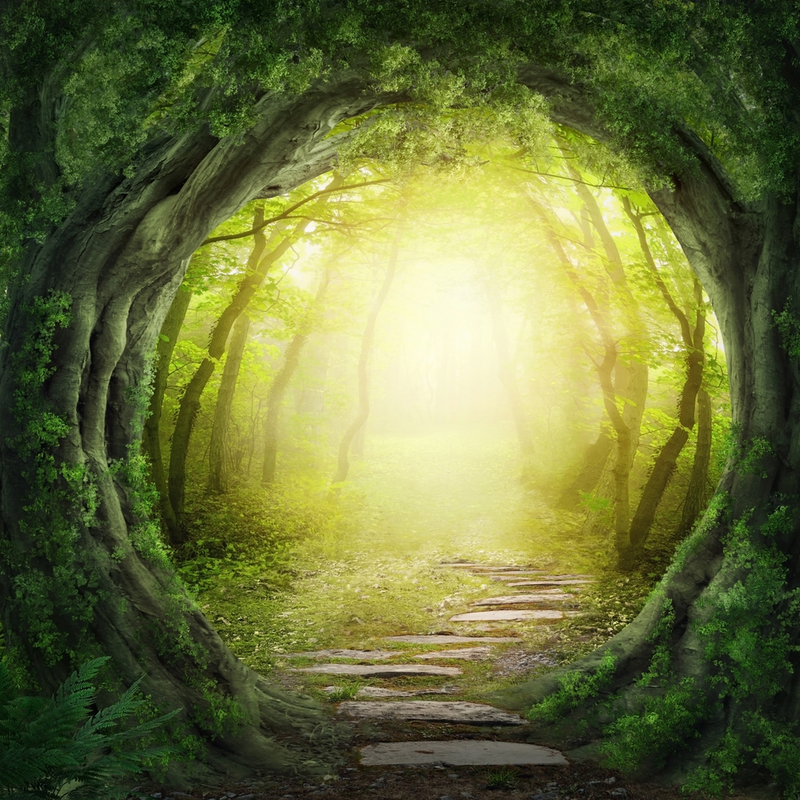 On April first and second, from 10 a.m. to 5:30 p.m., we will study faeries with Matthew Wood and Sean Donahue, two of the most alternative herbalists on the continent. Bring your microscopes! Wear your best faery finery. We will discuss the herbs, smudges, and smokes that the faeries like, or have taught us about, or that are traditionally associated with them. Cost $300. The gardens, set against the backdrop of the Tahoe National Forest and the Yuba River Canyon, are beautiful and inspiring year round. 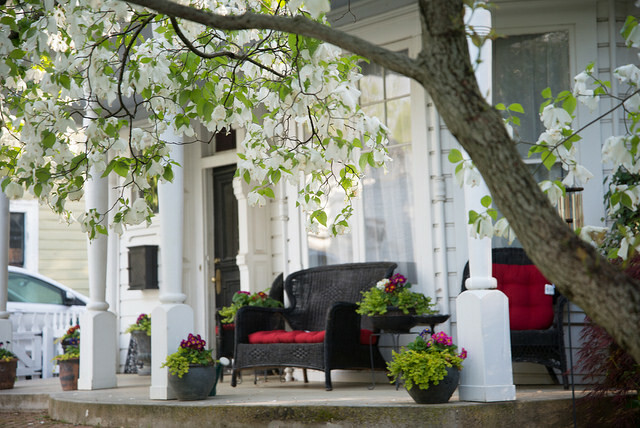 April visits for Springtime at Ananda are magical with thousands of vibrant tulips mixing with the complementary colors of cherry trees, wisteria, dogwood, azaleas, rhododendrons, peonies and pansies, just to name a few. The summer garden peaks in late July and August. In the cooler fall season, many flowers still bloom among the radiance of brilliant fall foliage. While every visit to the garden may be different, it is always wonderfully peaceful and uplifting. The upper gardens are open by donation every day 9am to 5pm. The lower gardens are open Monday, Wednesday and Friday 9am to 5pm, and by appointment. All donations directly help maintain the gardens as a special place for visitors. Nevada City’s 28th Annual Psychic Fair returns to the Miners Foundry Cultural Center, Saturday and Sunday, April 8 & 9, 2017. The Psychic Fair is considered Northern California’s largest gathering of metaphysical teachers, seers, crafters and readers. The Psychic Fair is open on Saturday, April 8th from 11:00 a.m. – 6:00 p.m. and Sunday, April 9th from 11:00 a.m. – 5:00 p.m. Admission is $5. Tickets are available online, at the Miners Foundry Box Office, or at the door. This year’s Psychic Fair offers attendees an array of vendors including psychics, medical intuitives, acupuncturists, massage therapists, herbalists, and alchemists. Take in a lecture or workshop and gain information and knowledge, re-kindle a past fascination, or discover a new interest. 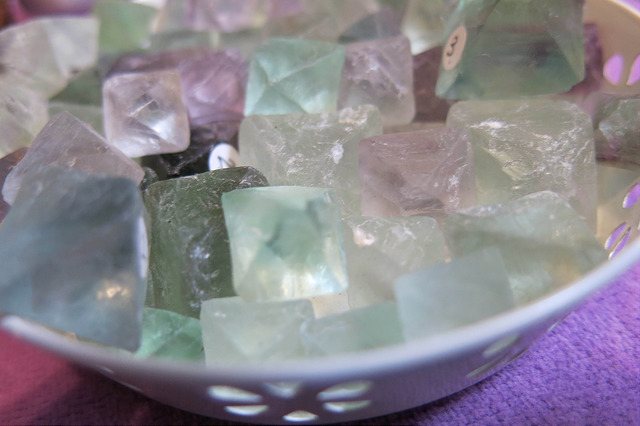 The Psychic Fair marketplace also features one-of-a-kind artisan jewelry, clothes, and accessories, natural skincare products, gem essences, crystals, and much more. When a small rock shop on Commercial Street was put on the market roughly eight years ago, Mimi Musgrave saw it as an opportunity to continue to sell her jewelry and immerse herself into another of her lifelong passions: rocks. Today, Mimi’s Crystal Rainbow Rock Shop is known for its rare, extremely hard-to-find gems and minerals from all over the world. Each year, Musgrave travels to large gem and mineral shows, where she can buy from dealers from all over the globe. Unlike large scale mining – such as what is being done for gold and silver — mineral mining has a minimal impact on the planet, because it is just scraping away at the surface, speeding up the inevitable erosion process. Musgrave hopes that having an appreciation for rocks and minerals will encourage people to take better care of the earth. She makes an effort to buy from small miners. Her purpose, she says, is to spread beauty and bring gifts to people, hoping her stones’ energy will be of help. 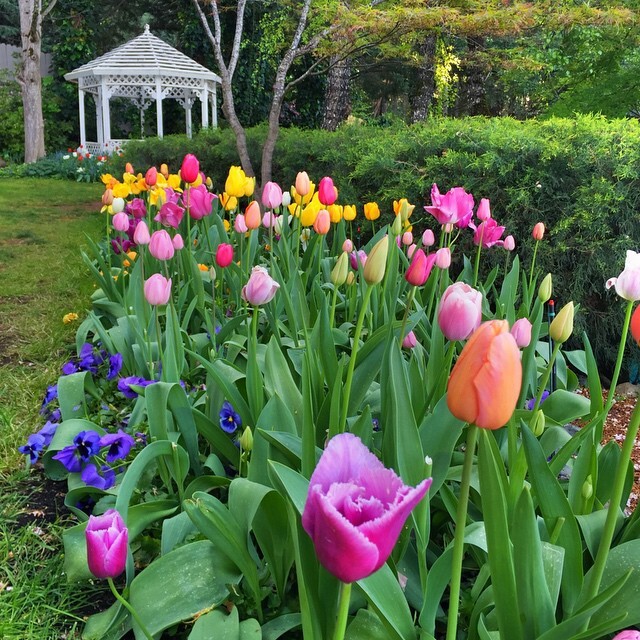 Come see over 10,000 tulips at the Crystal Hermitage Gardens Tulip Open House. 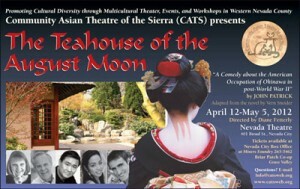 The dates this year are April 7 & 8 and April 14 & 15 10:00 A.M. to 5:00 P.M. This is a free event with live music, refreshments and gardening questions and answers. The Crystal Hermitage Gardens are located in the Ananda Village, just 15 miles from the Broad Street Inn. 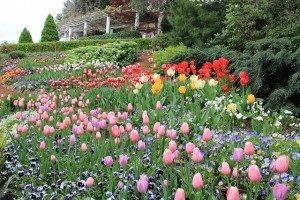 It is also possible to see the tulips on self-guided tours throughout the month of April between 8:00 A.M. to 8:00 P.M. 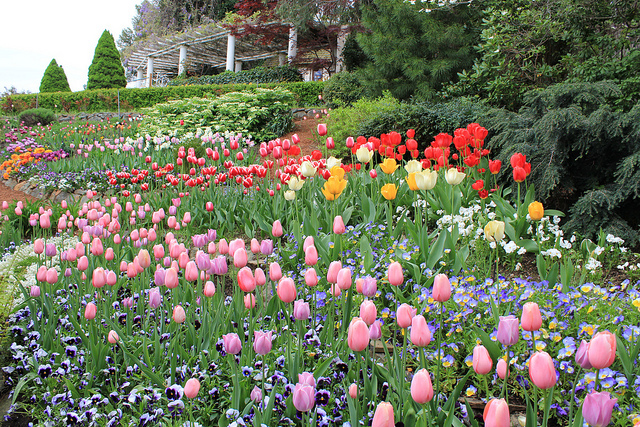 Check out our pictures of the tulips from last year on Flickr! Take a hike! Docent guided Wild Flower Walks will be held every weekend beginning March 17 through May 13 from 11:00 A.M. to 1:00 P.M. at the South Yuba River State Park. Bring a lunch, snacks, good walking shoes and a camera. 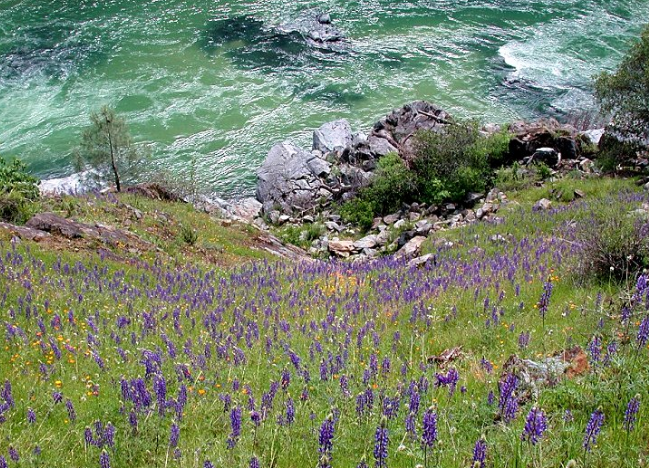 Take in the flowers and views of the South Yuba River on the Buttermilk Bend Trail. For more information call the Park Visitor Center at 530-432-2546 or visit their website at www.southyubariverstatepark.org. This is a fun, family event and you can support our local park by donating a suggested $3. For a new way to see Nevada City, go on a food tour! 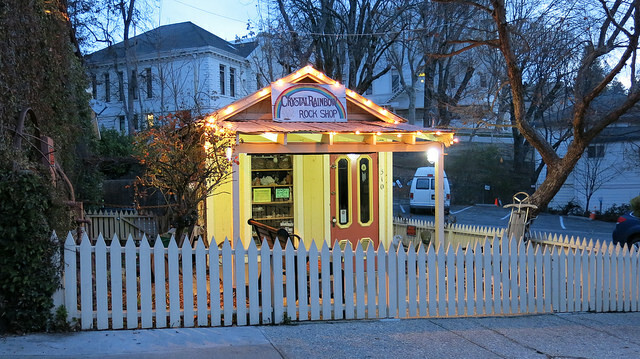 We highly recommend Local Roots Food Tours for a fun and interesting way to discover Nevada City for first-time tourists or return visitors. Read our blog on our food tour experience by clicking on the blog tab above or clicking HERE. Once a month, join local bird expert Bill Cortright on a birding expedition along the South Fork of the Yuba River. 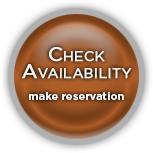 The 2012 schedule is posted on the South Yuba River State Park website or click HERE.